Hosting one of the largest higher education systems in the nation makes it difficult to sum up the depth of New York's offerings and initiatives. The state offers over 300 postsecondary schools, awards more grant money than every state except California and as of 2015, reports an enrollment of nearly 90,000 fully online students in its public and private schools. The state also boasts a remarkable number of support services dedicated to its distance students, from consortiums of schools to pacts with neighboring states, all of which we will explore below. So, before we dive into the best online colleges in New York, let's begin with the state of higher education and online education in New York today. According to National Center for Educational Statistics (NCES) data on the 2015-16 school year, there are 304 degree-granting colleges and universities in New York. This total includes 43 public educational institutions, 170 nonprofit institutions, and 44 for-profit institutions. The NCES data also shows just over one million New York students enrolled at degree-granting postsecondary institutions in 2016. In the U.S., a total of nearly 20 million learners enrolled in degree-granting colleges and universities during this same time period. In this current academic year, the average tuition and fees in New York remain low compared to other states. For an in-state student attending a four-year public school in New York, the average in-state tuition and fees total nearly $8,000, according to College Board data. Out-of-state tuition and fees for four-year public schools in New York average $19,500, according to the College Board. Additionally, tuition and fees at New York’s flagship university, the State University of New York at Buffalo, cost an average of $9,800 for in-state residents and $27,300 for out-of-state residents during the 2017-18 school year. Students may receive financial aid in the form of need-based and non-need-based grants in New York. According to the NASSGAP annual survey, the amount of need-based and non-need-based grants issued during the 2015-16 school year in New York totaled over $1 billion. This included approximately $970 million in need-based grants and $38 million in non-need-based grants. In New York, approximately 191,800, or 14.9%, of the enrolled student body takes at least one course at online colleges in NY, according to the Digital Learning Compass Online Learning Survey. Approximately 89,000 students in New York, or 6.9% of all students in the state, take all courses through online schools in New York. These distance learners include 67,000 undergraduates and 19,000 graduates. Among these degree candidates attending online schools in NY, a total of 41,800, or 47%, reside in state. Approximately 1.2 million, or 93.1% of students in state, take a mix of on-campus and distance courses, according to the Online Learning Survey. Two leading advocates of online education in New York are the New York Distance Learning Association (NYDLA) and the New York State Distance Learning Consortium (NYSDLC). NYDLA identifies itself as the “Premier remote work, distance/digital learning and collaboration association in the United States and beyond.” While such associations direct efforts towards students in need of a directory of courses and cross-institutional exchanges, the NYDLA focuses on the professionals of online education, providing them with resources like blogs, conferences, and podcasts that track the latest efforts in distance education in New York. The NYSDLC, on the other hand, serves students directly, offering them the chance to pursue distance courses across a whole host of New York institutions, both at the high school and collegiate levels. A major selling point of the organization involves ensuring students receive the credit they deserve for any distance courses completed in New York, making them a vital resource to any distance student who earns their degree across several institutions. While the extent of their online collegiate offerings appear to vary semester by semester, the NYSDLC clearly advocates for higher quality online learning at all levels of New York education. New York is also one of six states allied under the New England Board of Higher Education (NEBHE). Through this partnership, students enrolled at public colleges in member states can take advantage of non-resident tuition breaks, shared programming, and simplified transfer processes. Benefits of the NEBHE are available to both online and on-campus students. For students at online colleges in NY, this often means they can pursue individual courses at universities that fall under the agreement, earning credits toward their degree at another institution — sometimes at comparable or even further reduced rates. The New England Board of Higher Education (NEBHE) offers a tuition break program known as the New England Regional Student Program (RSP). The program enables thousands of New England residents to enroll in out-of-state public colleges and universities at a discount. For eligibility, a permanent New England resident must enroll in an approved major not offered by the public colleges or universities in the learner’s own state. If you attend an out-of-state college closer to home than an in-state college offering the same program, you may also qualify for the tuition break program. To apply to an RSP-approved program, a student needs to check RSP availability at the college or university where they attend. The RSP tuition break saves New England residents more than $270,000 annually in tuition. According to the NEBHE, students have saved billions since the RSP’s establishment in 1957. In fact, the RSP reported that full-time RSP students saved an average of $8,000 during the 2016-17 academic year. The RSP’s 82 public colleges and universities offer more than 800 undergraduate and graduate degrees available in the following states: Maine, Massachusetts, New Hampshire, Vermont, Connecticut, and Rhode Island. Below, you will find our rankings of the best online four-year programs in New York. Our profiles look at how schools approach online education and then list out their services for distance students and their popular, fully online degrees. After reviewing the best online schools in NY, explore our state resources, like a database of every college and university in New York or our index of popular in-state scholarships. Founded in Oyster Bay in 1957, and moved to Stony Brook in 1962, Long Island's Stony Brook University continually tops rankings for public universities statewide and nationally. In 2001, Stony Brook joined the Association of American Universities with five other New York schools. Along with its on-campus programs, research centers, and community-based healthcare resources, the school leads among online colleges and universities in New York. Through Stony Brook's School of Professional Development, students can earn affordable online degrees and certificates at the graduate level, including master's degrees in liberal studies and human resource management. Candidates for the master's in liberal studies complete 15 credits of core coursework in topics like effective professional communication and effective professional thinking; then they complete 15 more credits in a thematic concentration of their choice. The program culminates in a capstone seminar and research paper. While earning their degree, students can choose an internship option for three or six credits that consists of 150 or 300 hours of work, respectively. The 30-credit human resource management master's degree also offers an optional internship practicum that requires 45 hours of work outside of the student's current place of employment. Human resource management coursework covers topics like foundation of human resources, organizational performance management, and employment law and policy. Students must take a foundation of human resources class in their first semester. Students access online courses delivered asynchronously through the Blackboard management system. The school also strongly enforces rules for appropriate etiquette for online students, requiring succinct, polite, grammatically clear language on class discussion boards in accordance with the university's student conduct code. Stony Brook holds accreditation from the Middle States Commission on Higher Education. Based in Greenwich Village, but with satellite campuses across New York City and in Shanghai and Abu Dhabi, New York University holds a prestigious reputation among private universities nationally and internationally. The school's global philosophy toward quality education shows through its foreign degree-granting campuses and academic centers and in its online learning programs. Students can earn online graduate and undergraduate degrees from NYU's School of Professional Development, one of the most highly regarded New York state online colleges. NYU features a unique, 36-credit online master's in translation degree. Online students select a concentration in either translating English into Spanish, Spanish into English, or French into English. The school only offers the Chinese into English concentration to on-site students. For the program's core coursework, students take theory and practice of translation and theory and practice of terminology. Electives include cross-cultural communication and a contrastive stylistics course specific to the chosen language concentration. The school also offers an online bachelor's in social science with a concentration in organizational behavior and change. For acceptance to the 96-credit, fully online degree, students must complete 30 credits of applied undergraduate studies at NYU (or another school) and a college algebra course. The program also requires students to complete prerequisite coursework in business organization and management, organizational behavior, two courses in the social sciences, and one in humanities before beginning concentration coursework. Concentration coursework includes business writing, business ethics, and collaborative team processes. The degree culminates with a social sciences project, research paper, or internship in the student's senior year. Students access coursework through NYU's learning management system and Big Blue Book meeting tool. Courses follow both asynchronous and synchronous formats. Students can use NYU's student information system to check which online courses follow the format they prefer before enrolling. Syracuse University began in 1831 in connection with Lima's Methodist Episcopal Church; then it relocated to its modern campus in 1870, officially becoming nonsectarian in 1920. The university maintains a high standing among private schools statewide and nationally, thanks in large part to its school of engineering. Learners interested in Syracuse's innovative STEM degrees can pursue their education online through University College, the center for part-time studies and a standout among New York state accredited online colleges. Syracuse's 30-credit online master's in computer engineering consists of 12 core credits and 18 elective credits. The program's four core courses encompass computer security, internet security, advanced computer architecture, and internals of advanced data structures. Elective coursework can include object-oriented design, machine learning, and principles of operating systems. Due to the intense rigor of Syracuse's online engineering graduate programs, the school strongly encourages students, depending on their professional and academic experience, to take preparatory coursework in topics like discrete mathematics, data structures, and operating systems. Students can complete the program in as little as 15 months. Undergraduates pursuing technical degrees can also enroll in Syracuse's bachelor's in cybersecurity administration degree. The 120-credit program consists of 30 credits in professional competencies, 30 credits in liberal studies, 33 credits towards the major, and 27 credits in electives. Students obtain the skills needed to manage technological tools, safeguarding information, information systems, and infrastructure. Core curriculum includes introduction to knowledge management and leading issues in information security for professional studies. Syracuse's online coursework uses the Blackboard learning management system and typically follows an asynchronous format. However, students pursuing an online bachelor's in cybersecurity administration can anticipate interactive live sessions throughout coursework. Some programs offered through University College require a residency component, though many, such as the aforementioned online master's and bachelor's degrees, require no in-person element. Established in 1870 by German Jesuits, Canisius College garners high accolades for its programs in business, teacher education, and pre-medical studies. In recent years, the school introduced innovative and unique majors, such as anthrozoology in a hybrid and a fully online format. Learners interested in earning a teaching-related degree from Canisius can pursue an online master's in community and school health or a master's in applied nutrition through the School of Education and Teacher Services. The 33-credit master's in community and school health prepares students for healthcare administration, health policy application, and public health education programming. Core curriculum includes program planning in healthcare, healthcare systems, and health impacts on K-12 success. Near the end of the program, students complete a guided elective with their adviser's help. Learners also complete a culminating master's project or research paper. The 33-credit master's in applied nutrition gives students the choice between a concentration in obesity and eating disorders or fitness and sports nutrition. Core curriculum includes clinical health behavior change, advanced nutrition, and research methods in allied health. Track-specific courses cover specialized topics, such as sociology of nutrition and fitness psychology. The program caters to working professionals with registered dietician (RD) certification, preparing them for managerial and administrative positions in schools and public health, government, and healthcare organizations. Canisius requires non-RD students to take an introductory nutrition course as a prerequisite. The 15-month degree culminates in a master's project or research paper. Online coursework takes place through the Desire2Learn platform and typically follows an asynchronous format. Canisius' School of Education and Teacher Services holds accreditation from the National Council for Accreditation of Teacher Education. One of the few engineering schools in New York, Rochester Institute of Technology frequently garners accolades for its programs in computing, engineering, and imaging science. It also maintains a strong reputation among online colleges and universities in New York, offering many online graduate and undergraduate degrees and certificates. Busy professionals interested in a STEM degree from RIT can pursue an online master's in imaging science or an online master's in microelectronics manufacturing engineering. RIT designed its 30-credit imaging science master's degree to emphasize a systems approach. Learners leave equipped for a position in imaging science research, ready to apply imaging diagnostic methods for issues in medical and data engineering. Coursework includes Fourier methods for imaging, optics for imaging, and image processing. The school gives students a choice between the radiometry or the human visual system concentration. Full-time learners complete the program with a research thesis, while part-time learners can choose to finish with a final project if they possess sufficient relevant professional experience. The program typically takes between two and four years to complete. The 30-credit microelectronics manufacturing engineering master's degree caters to those with engineering bachelor's degrees, preparing learners for work in the semiconductor industry. Core curriculum encompasses topics like microelectronic fabrication, nanolithography systems, and microelectronics research methods. Learners typically complete the program within 2-4 years and go through an internship as a culminating project. The school requires learners with non-electrical or non-microengineering bachelor's degrees to complete additional bridge coursework. The university was founded in 1829 as the Rochester Athenaeum literary society. It underwent a merger with The Mechanics Institute to become a practical technical institute in 1891 and a full research university in 1944. With campuses in Brooklyn and Long Island, Saint Joseph's College-New York offers over 50 majors in graduate and undergraduate degrees, certificates, and special programs. Today, the college serves as one of the most affordable and well-regarded New York state accredited online colleges. The school has built on its prestige with unique offerings in online learning programs, such as an online master's in human services leadership and an online bachelor's in health administration. The 30-credit online master's in human services leadership equips learners to work in administrative positions in the human services industry. The 10-course curriculum tailors to working professionals and covers topics like leadership dimensions in human behavior, leading in mission-driven environments, and integrative analyses in human services leadership. Over the course of the program, students document the application of their studies to their professional lives through a Competency Application Project, developed from self-assessments and other diagnostic tools. The 120-credit bachelor's in health administration comprises 18 credits in major requirements, 19 credits in core coursework, 15 credits in major electives, 3 credits in social science, 35 credits in liberal arts requirements, and 30 credits in other electives. Major requirement topics include healthcare delivery systems, legal aspects of healthcare, and healthcare management. The 19 core credits include courses like problem solving for professionals, fundamentals of statistics, and library research strategies.The program prepares learners for administrative positions in hospitals, long-term care centers, and outpatient clinics. Learners take asynchronous coursework through MySJC online portal, powered by the Canvas and Blackboard learning management systems. The school allows students to transfer up to 90 credits from another regionally accredited school and 82 credits for prior learning from training programs, certifications, and examinations. SJCNY began in 1916 as a college for women, becoming co-ed in 1970. Founded by Vincentian priests and based in Lewiston, Niagara University ranks highly among affordable and accredited private universities thanks to its strong liberal arts programs. The relatively small school also features an online master's in special education and an online master's in educational leadership. Articulation agreements and cheap tuition make the school a reliable transfer option for professionals earning associate degrees through New York community college online courses. NU requires candidates for the 40-credit master's in special education program to hold a teaching certificate. Students choose between getting the master's in special education for grades 1-6 or 7-12. Foundational curriculum for both specializations differs slightly. Candidates for teaching students with disabilities from grades 1-6 study topics like managing culturally responsive classrooms and characteristics of students with exceptional needs. Those on the 7-12 track study literacy for upper grades and independent living for individuals with disabilities. The master's degree leads to initial certification to teach students with disabilities in either grade range. The school requires learners in both specializations to complete a seminar course on special education, a 100-hour practicum, and a culminating portfolio presentation. The 36-credit master's in educational leadership prepares students for school and nonprofit leadership roles. Core curriculum includes instructional supervision, school business administration, and employer-employee relations in education. The program requires all students to hold teacher certification and a bachelor's in teaching. NU candidates must also take prerequisite coursework in educational research and statistics and show proof that they meet state requirements for school violence and child abuse prevention knowledge. The school primarily uses a synchronous learning model, emphasizing live video conferences accessed through Canvas. NU began as Our Lady of Angels Seminary in Buffalo. It relocated to its current campus in 1857 and changed its name in 1883. Founded in 1891 and overlooking Lake Ontario, SUNY College at Oswego serves as one of the finest public universities in New York. In-state and out-of-state learners interested in New York state accredited online colleges should note the school's online bachelor's programs offered through the Division of Extended Learning. SUNY Oswego's online bachelor's in criminal justice and online bachelor's in wellness management tailor to associate degree holders looking to continue their education. Articulation agreements with schools like Mohawk Valley Community College make SUNY Oswego a great choice for students earning an associate degree through New York community college online courses. The 45-credit online criminal justice bachelor's degree consists of 24 core requirement credits and 21 elective credits from anthropology, sociology, psychology, and other related fields. The program requires candidates to take data analysis, research methods for criminal justice, and a seminar in public justice through SUNY Oswego. The school gives candidates the option to complete an internship in a relevant work setting for credit through the Center for Experiential Learning. Candidates for the 57- to 59-credit wellness management bachelor's degree take 21 credits of core requirements, 18-20 credits of electives, and 18 credits of cognate requirements. The program prepares candidates for positions relating to public health and health promotion in public, nonprofit, and corporate organizations. Core curriculum covers the essentials of exercise physiology, health promotion program planning, and wellness skills. Cognate requirements encompass psychology, biology, marketing, and management. Learners must also choose between two course sequences in their electives: one in human anatomy and physiology and the other in kinesiology. For the bachelor's degree culminating project, SUNY Oswego allows learners to choose between an exploratory practicum and an internship. Learners take online courses asynchronously through Blackboard, with online courses accessible the week before classes begin. Spread across several campuses in upstate New York, SUNY Polytechnic Institute serves as the sole public polytechnic college in the state and continues to grow its reputation as an affordable and reliable option for in-state and out-of-state students. The school offers many accredited online programs, including an online bachelor's in nursing and an online master's in accountancy. SUNY Poly's articulation agreements and affordable tuition make it a great option for those earning associate degrees from online community colleges in New York. The 124-credit bachelor's in nursing tailors to associate holders looking to continue their education. Core curriculum topics include theoretical bases of professional nursing, caring processes in pharmacotherapy, and concepts of holistic nursing. The program culminates with a nursing seminar in the form of an internship, field experience, clinical experience, or study abroad component. The program also comes in an accelerated bachelor of science to master of science format, leading to a master's in nursing education or family practice. SUNY Poly designed its 33-credit master's in accountancy to cater to working professionals with busy schedules and satisfies New York's 150-hour requirement for licensure. Learners take 15 credits in accounting, another 15 in business, and three in electives. Accounting curriculum covers advanced financial accounting theory, advanced income tax research, and advanced auditing theory. The school may tentatively admit learners without a bachelor's in accounting, but it may require them to take up to 18 credits in prerequisite coursework in auditing, cost accounting, and tax accounting. Learners access both online asynchronous and synchronous courses through Blackboard. Most courses in the bachelor's in nursing program heavily use synchronous elements. SUNY Poly's online nursing bachelor's degree is accredited by the Commission on Collegiate Nursing Education. Founded in 1900, Davis College is a Baptist college based in Johnson City, taking its namesake from founder John Adelbert Davis. The Bible college mostly confers bachelor of religious education degrees, specializing in biblical education over general education credits. Since launching its online learning program in 2012, Davis College now features many affordable online certificates and general education courses, including an online certificate in teaching English as a second language (TESL). The 24-credit TESL certificate comes in either a standalone format that takes two semesters to complete or as a concentration in the school's four-year bachelor of religious education. Curriculum topics include cultural anthropology, structures of the English language, and linguistics. The standalone certificate program tailors heavily to students with bachelor's degrees, preparing graduates for positions in adult and child literacy education. Learners conclude the certificate program with a TESL internship. The bachelor's degree most benefits those interested in missionary work. Learners within the bachelor's degree with a concentration in TESL can anticipate a significant amount of Bible-focused coursework. Students access asynchronous coursework through Blackboard. Each eight-week semester, the school offers diverse general education courses online in mathematics, general psychology, and earth science. Credits earned through Davis' online learning courses typically transfer to most higher education institutions, making it a great choice for working professionals returning to school. All online courses enforce firm participation requirements, many requiring the purchase of textbooks from the online store. Davis College is accredited by the Middle States Association of Colleges and Schools. Serving upstate New York across three campuses in Troy and Albany, the Sage Colleges distinguished itself in recent years as one of the more highly ranked New York state online colleges. The private school offers many affordable, flexible online degrees at the undergraduate and graduate levels, including its online master's in business administration (MBA) and the online master's in applied behavior analysis and autism (ABA and autism). The 42-credit online MBA tailors coursework to working professionals in the management industry transitioning into high-level positions. Core curriculum inquires into the behavioral aspects of the management industry, with topics in executive decision making, management information systems, and marketing systems. Learners can choose the MBA with a concentration in either marketing or human resource management or take three specialization courses with department approval. The program requires learners without a background in management or business to take prerequisite coursework in economic analysis, financial accounting, and legal environment under the guidance of their enrollment counselor. The 34-credit master's in ABA and autism prepares working professionals in a relevant industry, such as social work, to specialize in helping people with autism. Core curriculum topics include behavioral assessment, research in ABA, and core skills in autism. If learners choose to combine the course track with an optional, four-part clinical practicum for a total of 42 credits, learners can sit for the Behavior Analyst Certification Board Exam after graduation. Learners can also substitute the practicum with independent field hours under department guidance. Additionally, the program allows learners to take an optional three-course thesis sequence for research in ABA. Learners take a blend of asynchronous and synchronous coursework through Blackboard. The Sage Colleges waives its application fee for online students. The online MBA program is accredited by the International Assembly for Collegiate Business Education. Established in Albany in 1971, Excelsior College is a private, nonprofit institute that focuses on delivering practical and flexible distance education. For this reason, Excelsior has steadily maintained a reputation as one of the most reliable New York state accredited online colleges. The institution also stands out for its generous transfer policies. Transfer students to one of Excelsior's many online bachelor's programs can transfer up to 115 credits, making it possible for transfer students to finish their degree in one semester. Excelsior also features many online master's programs that allows students to transfer 15 credits toward degree completion. The 120-credit online bachelor's in psychology consists of 60 credits in arts and sciences and 60 credits in either applied professional courses or additional arts and sciences courses. Learners must take 33 credits within the major, including a three-credit culminating capstone. Core curriculum topics include experimental psychology, history of psychology, and statistics -- preparing learners for careers in teaching, social work, and sales. The 30-credit online master's in criminal justice caters to working professionals on a budget. Learners take 18 credits within the major and complete a three-credit culminating capstone. Interdisciplinary core curriculum topics include criminology, research methods in criminal justice, and quantitative analysis for criminal justice. The degree also offers learners the option to pursue a concentration in homeland security and emergency management or in justice administration by completing nine credits of specialized coursework. The school allows learners to transfer a maximum of 15 credits toward their master's degree. Learners access mostly asynchronous coursework through Canvas. The school offers a free Canvas orientation information page and free tutoring to all learners. Excelsior college is accredited by the Middle States Commission on Higher Education. St. John's University-New York is a Catholic online college in the Vincentian tradition. Founded in 1870, St. John's has since grown into a metropolitan, global university, and a New York state accredited online college. It welcomes students of all faiths, with more than 20,000 students from over 116 countries. A private university, St. John's has expanded its online courses in recent years, offering 27 graduate degrees and certificates online, plus dozens of undergraduate courses each semester. Graduate programs include accounting, homeland security, literacy, taxation, and theology. Undergraduate offerings include subjects such as anthropology, mathematics, and rhetoric. Online students use Blackboard to connect with faculty and peers and enjoy access to the same student resources as those on campus, including library access, writing assistance, academic advising, and career services. Instructors deliver most coursework asynchronously, and online students do not need to visit campus, though they can with a student ID. Online students pay the same tuition and fees as their on-campus counterparts, though expenses vary depending on each student's program of study. Online students can access many of the same university scholarships as on-campus students. Online offerings from St. John's hold accreditation from the Middle States Commission on Higher Education. Some programs also hold programmatic accreditation. All programs follow guidelines from Quality Matters, a third-party, nationally recognized quality assurance program for online courses. Full-time faculty teach most online courses. As a member of the National Council for State Authorization Reciprocity Agreements, St. John's may offer online programs to students in other member states. Buffalo State, the largest four-year college in the SUNY system, boasts over 100,000 undergraduate alumni. Buffalo State, a New York state accredited online college, holds accreditation from the Middle States Association of Colleges and Schools; many of its programs hold programmatic accreditation, as well. The university participates in the National Council for State Authorization Reciprocity Agreements, and has been in operation since 1871. Over 94% of the classes at Buffalo State comprise fewer than 40 students, and most undergraduate major courses include 12-15 students, allowing more opportunities for direct contact with faculty. The school offers online courses in four formats. Hybrid classes contain a mixture of online and on-campus instruction, while hybrid-plus courses comprise 80% online courses and 20% on-campus classes. The school also makes fully only courses available in either synchronous or asynchronous format, with no on-campus requirements. Buffalo State offers three online master's degrees in adult education, music education, and public relations -- plus two advanced certificates in adult education and human resource development. Graduate students may apply for degree or certificate programs, including teacher certification programs. Undergraduates may only take online courses as non-degree-seeking students, meaning that the courses do not count toward a degree. Undergraduates may take up to 11 online credits, and they may apply toward a degree if the student fully matriculates to Buffalo State. Online students who do not live in New York, and who have not lived there for more than one year, may qualify for special tuition rates. Exclusively online students may pay a special tuition rate, which amounts to roughly half of the usual out-of-state tuition. In the fall semester of 2016, 89% of Buffalo State students received some amount of financial aid, with the average full-time undergraduate receiving $17,443. Non-degree students do not qualify for financial aid. Mercy College, a private four-year college based in Dobbs Ferry, hosts additional campuses in Manhattan, the Bronx, and Yorktown Heights. It offers over 200 online courses, with more than 30 degrees and certificates available fully online. Among other online colleges and universities in New York, Mercy holds accreditation from the Middle States Commission on Higher Education -- plus programmatic accreditation for several of its degrees and membership with over 30 associations. With 207 full-time faculty and just under 10,000 students, Mercy favors small class sizes. Nearly all of its courses comprise fewer than 30 students, and 56% harbor fewer than 20. Mercy students come from 45 different states and 46 different countries. Online students at Mercy enjoy access to academic advising, career services, and financial assistance. The university also maintains an online learning center and provides an orientation to help students adjust to online study. The school offers courses in three different learning modes for maximum flexibility. Exclusively online classes require no time on campus, while blended online courses meet on campus and include online requirements. Web-enhanced courses use Blackboard as a supplement to on-campus classes. Online students pay the same tuition rates as those attending on campus, with no distinction between resident and nonresident students. Overall tuition costs may vary depending on degree type, with undergraduates paying tuition by credit or per term, plus program-based fees each term. Graduate students pay per credit depending on their chosen program, with some programs incurring additional fees. International students pay the same rates as their American peers, with the addition of a one-time fee paid at enrollment. A Christian college focused on liberal arts and professional studies, Roberts Wesleyan College, was founded in 1866 by B.T. Roberts -- who also co-founded the Free Methodist denomination. The school began in one room of a farmhouse in Rochester, New York to provide religious education to poor children. The college has since expanded its offerings, but remains relatively small, with an 11-to-1 student-to-teacher ratio. Over 1,700 students choose from among more than 60 programs, including 14 graduate programs and nine online degrees. Roberts offers online degrees in business, teacher education, health administration, nursing, and divinity studies at both the undergraduate and graduate levels. Instructors at Roberts teach online programs in accelerated formats, allowing students to finish their degrees in 1.5 years. Most students pay tuition on a per-year basis, while others pay per credit, though the exact expenses vary by program. Undergraduate online programs cover only most of the degree, meaning students must already possess at least 60 credits from another accredited university or college. Moreover, most online programs offer master's degrees, meaning incoming students should already possess their bachelor's degrees and relevant work experience. Roberts holds accreditation from the Middle States Commission on Higher Education and boasts membership with both the Council of Christian Colleges & Universities and the Association of Free Methodist Educational Institutions. Founded in 1906, Pace University maintains campuses in Lower Manhattan and Westchester County and offers multiple online programs. Focused on the liberal arts and sciences, Pace enrolls more than 13,000 students, with a student-to-teacher ratio of 20-to-1. It places second in the nation among private colleges for economic mobility of students from the bottom fifth of income distribution, according to a study by the Equality of Opportunity Project. Pace emphasizes real-world experience, with over 7,000 students participating in co-ops, practicums, internships, and other hands-on learning experiences each year. Pace University works to integrate distance education into its standard curriculum, ensuring online students enjoy access to the same quality education as their on-campus peers. The university also offers a number of online bachelor's programs including in business studies, professional studies, and nursing. The university also offers online and blended graduate programs in public administration, publishing, and internet technology. Degree completion programs serve students who want to complete their bachelor's degrees but require the flexibility of online courses. These programs require that students already posses most of their general education and elective credits, which they can transfer toward their degree at Pace. The school's graduate offerings provide students with a bachelor's degree the chance to increase their earning potential through advanced education. Pace also offers courses for non-degree students, undergraduate certificate programs, a GED program, and College LEvel Examination Program exams. Online tuition varies by program, and the average incoming undergraduate at Pace receives about $25,000 in financial aid. SUNY Delhi boasts a 16-to-1 student-to-faculty ratio, plus numerous accreditations, including accreditation from the Middle States Commission on Higher Education. Founded as an agricultural school in 1913, SUNY Delhi started in a single building with nine students. Today, it hosts over 3,000 students and dozens of programs at both the undergraduate and graduate level, including eight online programs. SUNY Delhi uses Vancko Hall, also known as Moodle, to deliver virtual content for online, hybrid, and web-enhanced courses. Online courses do not require on-campus visits, but online graduates may attend graduation ceremonies on campus. Out-of-state students pay more for online courses than their New York-resident counterparts, but they pay less than on-campus nonresident students. Students from any state may enroll in online programs at SUNY Delhi, with the exception of Florida nursing students -- due to state regulations. Instructors deliver courses asynchronously, providing students with maximum flexibility by allowing students to study at their own pace. Still, these courses adhere to the school's normal academic schedule. Online students also receive the same access to student services, financial aid, and internship opportunities as their on-campus counterparts. Online programs also assign students with faculty advisers to help guide them through the degree process. The New School in the Greenwich Village neighborhood of New York City was the first university to offer courses on African-American history (taught by W.E.B. Du Bois) and women's history (taught by Gerda Lerner). The New York state accredited online college has long embraced small class sizes and unique courses, both on campus and through its web offerings. The New School offers more than 200 online courses each year. These courses follow an asynchronous format and follow a seminar format that allows students and faculty to interact more directly. The school emphasizes peer and faculty connections, allowing for easy, open communication. Courses utilize Canvas to deliver materials, and some make use of Zoom for video conferencing. The New School offers a variety of certificate programs, plus credit and non-credit courses. These include short courses, which students may complete in six weeks or less. They address contemporary issues in a variety of fields and industries, giving students the opportunity to build schedules that work for them. Flexible online offerings focus on professional development and continuing education. They allow students to study when and where they want -- and to personalize their certificates and overall education in ways that suit their interests. Students in online courses pay individually assigned tuition rates, rather than per-credit rates, and these expenses remain consistent regardless of students' state residency. Founded in 1875, Medaille College is based in Buffalo and Rochester, New York. Medaille began providing accelerated courses to working nontraditional students in the late 1990s and became an accredited online college in 2010. The college holds accreditation from the Middle States Commission on Higher Education, plus programmatic accreditation from the American Veterinary Medical Association, the Council for Accreditation of Counseling and Related Educational Programs, and the International Accreditation Council for Business Education, among others. Online students can pursue an associate, bachelor's, or master's degree at Medaille -- or an advanced certificate in a field such as business administration, veterinary technology, psychology, or homeland security. Online offerings give students the opportunity to tailor their schedules as needed, including how many courses they take each semester. The college boasts small class sizes, with a 16-to-1 student-to-faculty ratio, and each student pairs with a personal success coach to help them navigate the program. The college's generous transfer policy allows students to apply up to 90 credits (or 72 from a two-year college) toward their degrees. Classes use Blackboard to deliver course materials, arrange discussions, and let students collaborate. Online students pay the same tuition rate as their on-campus counterparts, but rates vary by degree and program, not by state residency. Medaille offers a discount to active duty military personnel, which can reduce some tuition rates. In addition to financial aid, students can apply work, life, or military experience to reduce tuition. Founded in 1896 in Brooklyn, Adelphi University represents the oldest private co-educational university on Long island. Its main campus in Garden City hosts nearly 8,000 students, and the university has graduated more than 100,000 alumni in 50 undergraduate programs and over 85 graduate programs. Adelphi focuses on doctoral research and graduate studies, and holds accreditation from the Middle States Association of Colleges and Schools and the New York State Education Department, along with several other accrediting bodies -- including the American Speech-Language-Hearing Association and the Council on Social Work Education. Adelphi also partakes in the National Council for State Authorization Reciprocity Agreements (NC-SARA), and students from NC-SARA member states may enroll in online programs in other member states. Online offerings at Adelphi divide into four areas of study: health and wellness, education, emergency management, and sport management. These areas of study constitute seven graduate degrees, two undergraduate degrees, and three certificate programs. The school caps online classes at a maximum of 25 students, and instructors deliver content via the Moodle content management system. The school makes both online and blended courses available, the latter requiring some on-campus study. Tuition rates and fees vary by degree level (certificate, undergraduate, or graduate) and individual program. These rates are unique to the online and blended options, but generally cost less than those for on-campus courses. Undergraduate students can receive tuition reductions through life experience benefits. They may also transfer credits from prior colleges and universities. Undergraduates must complete at least 30 credits at Adelphi to graduate. Founded in 1906 as a two-year college, SUNY Canton now offers 29 bachelor's degrees and 21 associate degrees, including 16 online major programs and over 450 online courses. Canton was the first school to join the National Association of Collegiate Esports, where teams compete from over 40 colleges and universities. SUNY Canton holds accreditation from the Middle States Association of Colleges and Schools, plus an Open SUNY+ distinction. The college also holds membership with the National Council for State Authorization Reciprocity Agreements, meaning students from member states qualify for online programs at Canton. Online courses offer several off-term options, including general education courses that help students catch up or get ahead on their degrees. Online program offerings include agribusiness management, finance, and veterinary service management. The school makes some programs available in a 2+2 format, in which the program's last two years take place entirely online after students complete the first two years on campus. Courses utilize the Blackboard course management system, with includes mobile access. SUNY Canton bases its tuition rates on state residency, but out-of-state tuition costs 15% less than the national average and 50% less than the average for private universities. Some programs may charge different tuition rates, not including book expenses or other fees. Online students enjoy access to the same resources as their on-campus counterparts, including advising, tutoring, library services, and even study-abroad experiences. Utica College was founded in 1946 by Syracuse University in an attempt to meld large school perks with the personal attention afforded by small, private colleges. Accredited by the Commission on Higher Education of the Middle States Association of Colleges and Schools, Utica offers certificates, bachelor's, master's, and doctoral degrees online in five program areas: economic crime prevention, business management, healthcare, cyber crime and criminal justice, and data science. All told, Utica offers 11 certificates, five bachelor's degrees, eight master's degrees, and one doctoral degree online. Utica makes use of the Engage learning platform to deliver online courses. Utica provides students with a variety of resources to help ensure their success, including dedicated program managers for each program, alumni services, and library and tutoring access. Utica also hosts virtual open houses in which prospective students can experience one-hour webinars detailing the expectations, learning outcomes, curricula, and student support related to each given online program. The final 20 minutes of each open house is reserved for questions. These webinars generally take place in March, July, and October, and the school archives them for viewing online. With few exceptions, Utica College is authorized to offer courses and degrees to students in New York and any other state participating in the National Council for State Authorization Reciprocity Agreements. The online master of science in nursing program, however, is only available to students from Massachusetts and Vermont. Dominican College of Blauvelt was founded as a Catholic college in 1952 and opened to secular students in 1957. Today, the school hosts around 2,000 students, 74% of whom study full time, and 75% of whom study as undergraduates. The college's 77 full-time faculty provide a 15-to-1 student-to-faculty ratio. Though Dominican began as a teacher's college, it has expanded to offer a variety of undergraduate and graduate programs in nursing, physical therapy, biology, and social work. Dominican offers some online courses, plus five fully online bachelor's degrees in business management, psychology, criminal justice, communication studies, and social science. Dominican's online programs cater to transfer students -- who can bring up to 70 credits with them from prior two-year institutions or up to 90 credits from four-year institutions. Applicants must forward transcripts from all previously attended colleges and universities and maintain a 2.0 cumulative GPA or better. Each student pairs with a specific adviser who helps them through the entire online education process. All incoming freshmen receive financial aid, and 77% of all undergraduates receive some amount of financial aid, averaging just above $26,000 each year. The school offers tuition deferment options for some students, along with special programs for active military service members and veterans. The Middle States Commission on Higher Education accredits Dominican to educate students and grant them degrees. Several of the college's degrees also hold programmatic accreditation from national organizations like the International Assembly for Collegiate Business Education, the Accreditation Council for Occupational Therapy Education, and the Council on Social Work Education. Based in Keuka Park, Keuka College was founded by Baptist minister George Harvey Ball in 1890. Today, the school hosts nearly 5,000 students on campus, online, and overseas. Its adult and online education division offers master's degrees in criminal justice administration, management, social work, nursing education, and nursing practice. It also offers bachelor's degrees in criminal justice systems, nursing, organizational management, and social work. The school makes online programs at Keuka available in both blended and flexible formats. Some programs offer fully online coursework. Students with prior credits can complete their bachelor's degrees in as little as two years, and most master's degrees take 18 months to complete from start to finish. Tuition rates vary by program and degree level and include all fees and expenses for books and course materials. These rates are locked in for the duration of each student's time in the program. Information sessions take place at a variety of locations around the state, giving students access to one-on-one guidance before enrolling. Keuka College holds accreditation from the Middle States Commission on Higher Education. It also holds programmatic accreditation from the International Accreditation Council for Business Education. Keuka offers programs in China, which boast approval from the Ministry of Education, People's Republic of China. The college offers several scholarships to help cover education expenses, such as the Criminal Justice Scholarship, which reduces tuition costs by 25%. Below you’ll find the very best online colleges in New York, sorted by affordability. 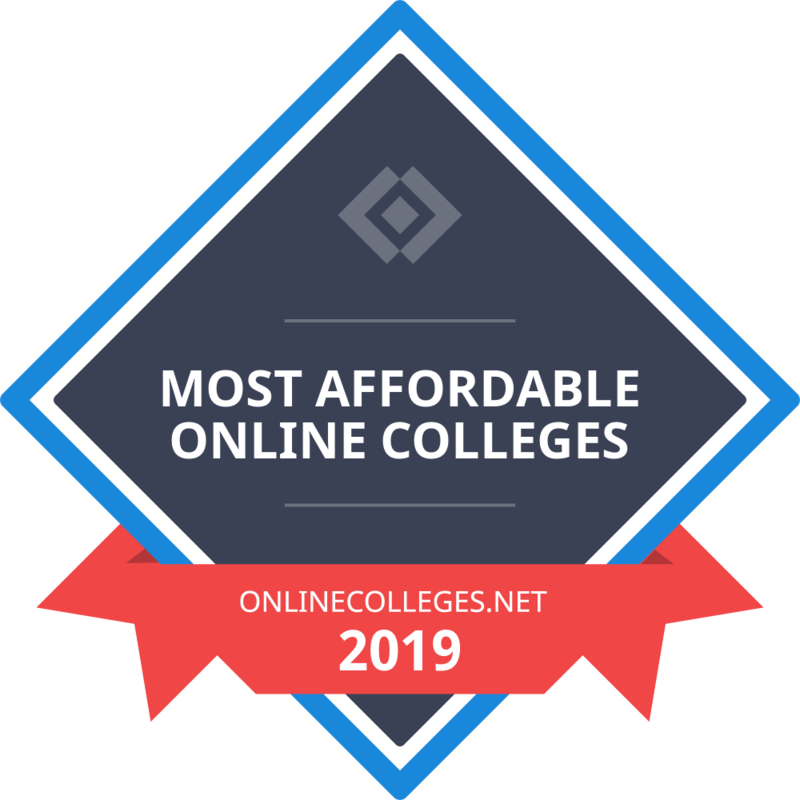 Our list of the most affordable online schools in New York is based on in-state yearly tuition, or annual tuition rates if a school does not differentiate between in-state and out-of-state students. Tuition rates are based on a full course load each semester or term. All colleges on the list offer at least one bachelor's degree completion program available entirely online. The online schools in NY with the lowest tuition are ranked highest, providing prospective students with a true list of the most affordable online colleges in their state. The job outlook for college graduates in New York remains positive. According to the BLS, the unemployment rate for New York State is very low, at only 4.5%. Additionally, the mean annual wage for all occupations in New York is $60,100. The New York mean annual wage is more than $10,000 higher than the national mean annual wage for all occupations. In May 2018, private sector jobs in New York City grew by 2.1%, according to the New York State Department of Labor. According to the Department of Labor, the state continues to see positive job growth with seven job sectors adding positions, and only manufacturing and information sectors losing jobs. The most significant industries in New York include accommodation; food services and drinking places; and professional, scientific, and technical services. With information provided by the New York Department of Labor, the table below shows the fastest growing occupations in the state. $1,000; open to students attending online colleges in NY, which includes high school students in an engineering or related program; requires a 3.5 GPA; must be a major in mathematics, science, engineering, or computer and information sciences; must provide proof of a household income of $50,000 or less. $500; must attend an online college in NY and reside in a New England state, including New York; hold an FCC amateur radio license; open to students pursuing a bachelor's degree in communications, electronics, or a related field. $500; Applicants needs to hold an FCC amateur radio license, hold a GPA of 3.2 or better, and reside in western New York. $15,000; open to high school seniors, including learners at online schools in New York; must hold licensure as harness horse caretaker or trainer in New York or New Jersey. $3,000; must be an undergraduate or graduate journalism student in the tri-state New York area; must submit a resume, writing samples, and an essay. $8,000; open to incoming college freshmen, including students at online colleges in New York; demonstrate financial need, good academic standing, and residency in New York's Warren, Washington, or Saratoga counties. $2,500; must hold a 3.2 or higher GPA; enrollment as a high school senior or college student majoring in a communications-related field; and residency in New York, New Jersey, Connecticut, or Pennsylvania. $7,500; must reside in New York; must be a graduate of a New York high school and hold good academic standing. $15,400-$23,500; awarded to spouses, children, and financial dependents of victims who died or received injuries as a result of the 9/11 terrorist attacks at the World Trade Center in New York, the Pentagon, airline flights, or during the resulting rescue and recovery efforts; must study at educational institutions in New York, including online colleges in NY. $1,500; open to spouses, children, or financial dependents of deceased police officers, firefighters, volunteer firefighters, or emergency medical service workers who died in service to the state of New York; must study at an approved postsecondary institution in New York, enroll full time, and demonstrate good academic standing.